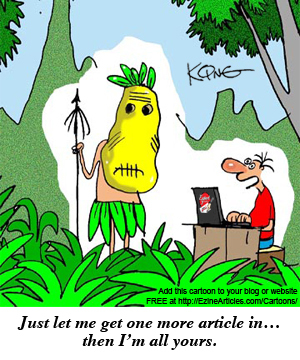 If you were about to be taken away and cooked up by cannibals, would you be as obsessed as the Expert Author in our cartoon about submitting just one last article? Now think about what specific quality most separates the truly prolific and successful article marketers from the rest of us mere mortals. Is it their writing talent? Is it their expertise in their niche? Is it their marketing experience and education? Without a doubt, it is the obsession to be writing and submitting a constant stream of high-quality, original articles that drives the incredibly successful EzineArticles Expert Authors to do what they do. From the moment they wake up in the morning, to the moment they fall asleep at night (and even while they sleep! ), they’re constantly conceptualizing, writing or submitting new articles to add to their inventory. They know from experience that more articles = more sales. As a result, they are forever obsessed with publishing more articles. Do you dream of incredible numbers of qualified visitors coming to your website? If so, then you need to become obsessed with writing and submitting as many articles as possible every single day. Only through this commitment to obsession will you ever rise to the level of the article marketing elite. Congratulations to Jan Ferrante for supplying the winning caption for today’s cartoon. She received a stylish EzineArticles mouse pad and other goodies for her efforts. Watch the EzineArticles blog for more Supply the Caption contests in the coming weeks. Oh my goodness. That is so me dealing with my children. Just let me finish this one article and I’ll cook dinner, change the channel, give you a snack, wash your clothes etc. Too funny! I can certainly see the humor and the root of truth in this one. It’s one more area where I can be compulsive! As if I need another one! :) But I’m meeting the HAHD challenge…woo-hoo! Very nice cartoon, I like it..
I`not from english spoken country, but I try to improve myself by by writing english article. This blog helps me a lot. Just a couple more seconds… Those are my words on a daily basis. But those seconds have a way of slipping by into minutes and then into hours. Good choice on the caption. I enjoyed reading the clever thoughts and creative captions from the authors. This was a fun idea. I’m glad this will be an ongoing project. Now that is a Powerful concept explained in a simple way.. This idea is not just written in this article but is shown vividly with an example. Thanks for giving a powerful tip for writing! Well, I’m not so sure about being cooked by cannibals. I’d probably have to buck on that one, but I AM obssessed with getting incredible numbers of qualified, unique visitors to my site and am really putting a lot of time into article marketing to do so. Yes, it’s obsession. For that we must have the writing sessions. For that we must find the time concessions. For that we must carry on with the captions and EzineArticles fashions. For that we must thank Marc for his lessons. Hmm? Maybe you are right? Still, I sometimes wonder how many “click throughs” that I’ve recieved from the 261,000 articles published? My guess is 10-15 each. Meaning 2.61 million to 3.9 million? But I am just guestimating of course. Obsession, addiction, anomalistic behavior? Hell, call it whatever you want, call me whatever you want, but please do glance up at the score board before negating the astute observations of this blog post, because I am pretty certain that the numbers prove this post to be spot on! Think on it, I rest my case. Did you write under different identities? I did not find any author writing more than 60k articles. I can’t just figure out how it is possible to write 261k articles in a life time by a single individual. But if you are employing more people for this task alone, then it is possible. This is a new idea if it were to work well. I think it is hungry and it eats bad articles. I am a reader, bad author, that can be an little and good author of articles writing in English, but I am not from english spoken country, I m trying to improve myself by writing english articles. I ask myself if that is possible, so I hope that yes. This blog helps me understand that I can learn how to do it. Demonstrating that it was possible to write 320,000 articles in a lifetime, but now I realize you were asking how is it possible that I had written 261,000 articles. The stats above of my article writing are taken directly from EzineArticles, stats from my secured author page. The 261,000 figure represents the number of times folks have went to reprint an article on an Ezine, website or blog. Although I have only written 16,236 articles, each article is picked up and republished, when that happens it results in my “byline” also being reprinted and more online links, which inevitably get clicked on, and direct more traffic to my site. So, to get these reprints, I do not have to write 261,000 articles, I only have to write articles that are of the quality which make republishing them worthy. See? I believe in this article. When a task becomes an obsession for you, you too passionate about doing it and the results will be tremendously amazing! Thank you for this extremely motivating article. Obsession, dedication and wanting more than anyone else! is what it takes! Guys live and breathe articles! :) awesome! I believe that obsession is the ultimate key. An old adage says: “Practice makes perfect”. Now I understand your point. Thank you for sharing your experience… Congratulations for your successful marketing. I think I myself have stumbled upon several of your articles searching information on the internet. I remember the phrase – worldthinktank, though I forgot your name.